The Lebanon Valley College chapter of the National Association for Music Education (NAfME) had the recent opportunity to participate in a Makey Makey workshop with Lower Dauphin Middle School students. Club members helped direct the session as part of Music in Our Schools month. Makey Makey kits allow students to produce music using computer programming and everyday objects capable of conducting electricity, such as bananas or copper tubing. Participants use a circuit board and a USB drive to connect various objects to the programming from the Makey Makey website. Katelyn Neiswender ’17, vice president of Songfest (a national music training program), assisted Dr. Sharon Davis, LVC assistant professor of music and director of music education, with organizing the event. “I was approached to run the event by Dr. Davis, and I thought the idea was really interesting! We had a couple of workshops about how to use the Makey Makey, and I contacted local schools that were interested in having us,” recalls Neiswender. Members devoted a portion of their spring break to teach the workshop to the Lower Dauphin students. Neiswender opened the workshop with a presentation that explained the capabilities of Makey Makey and taught students how the equipment could turn any object into a music-making device. Both raved about the benefits that this technology could provide students in the classroom. 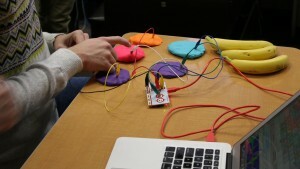 “Makey Makey gives a new spin on how music is created and opens up a whole new way to think about music and how we create music,” says Neiswender. Along with the benefits for LVC students, Matt Dickinson ’95, the Lower Dauphin teacher who partnered with LVC on the project, said it was a great day for everyone. 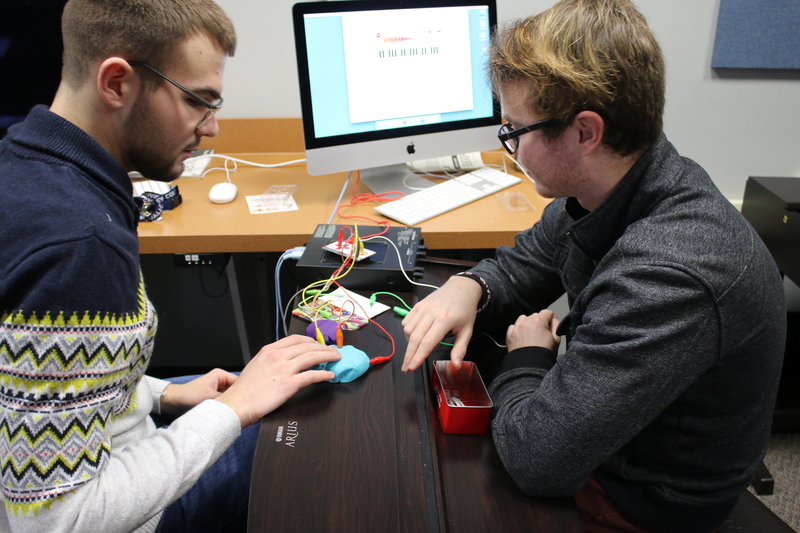 Looking toward the future, Habecker believes that the multidisciplinary nature of the Makey Makey program could best assist students and teachers in a general music classroom. “Ensembles typically need to practice repertoire or technique; however, in a general music classroom, students can explore a multitude of options to help them learn pitches, chords, rhythms, and other items,” he explains. Both felt that the experience was a success, and had several students approach them to inquire about purchasing the equipment for their personal use. “What we did with Makey Makey barely scratched the surface of possibilities that come with it. There are so many possibilities that come with the technology that any subject area could make use of it,” says Habecker.